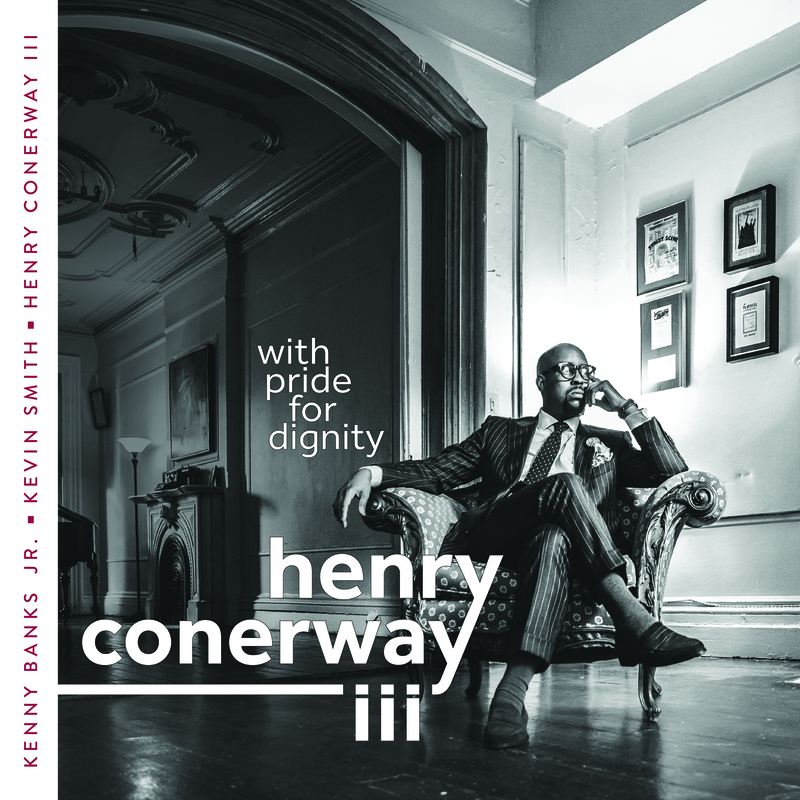 Drummer and composer Henry Conerway III is proud to announce the September 4th release of his debut album With Pride For Dignity. Featuring pianist/composer Kenny Banks Jr. and bassist Kevin Smith, With Pride For Dignity is a compelling musical statement which serves as both an homage to the ancestors and a powerful self affirmation. The album will be celebrated on September 4 at Dizzy’s Club Coca-Cola at Jazz at Lincoln Center, NYC. On With Pride For Dignity, the Detroit Native, New York resident utilizes the diverse gifts of his collaborators to full effect. Banks’ encyclopedic vocabulary of the piano traditions serves him well as he moves from the stride piano of the parlor to the gospel of the church, to the angular post bop lines of his improvisations. Smith’s nimble and technical mastery of the bass comes in handy as he negotiates the intricate melodies and contrapuntal lines of the arrangements. Contributing to the success of this album is the discipline of each trio member to bring his personality to the effort, their comfort with one another and the seamless communication that is ever present. With Pride For Dignity is comprised of three original compositions and five re-imagined gems. The title track, penned by Banks, begins as a haunting piano elegy that moves into a blues feel before settling into a two-beat antiqued stride. Similarly “The Feel Goods”, also credited to the trio’s pianist, is another blues tune. There are many extraordinary drummer/band leaders on the scene today who have expanded our appreciation of the art of drumming as well as heightened the vitality of the music itself – both in concept and through composition yet recordings of solo drum compositions are still all too rare. Conerway addresses this lack with “Carvin’s Agreement”. Named for his mentor and teacher, the legendary Michael Carvin, “Carvin’s Agreement” is a spontaneous composition that gives insight into the musical mind and intuition of Conerway as both composer and musician. “Carvin’s Agreement” reminds us of the power of the drum to capture our imagination and the centrality of rhythm to all music and to all life. While Banks, Smith and Conerway display their individual and collective virtuosity on Duke Ellington’s “Cottontail”, their take on Jimmy Heath’s “Gingerbread Boy” exhibits their interest in the intersection of rhythm, meter, and swing. This is a complicated arrangement, but it is executed so well that the complexity never overshadows the music making. Another stand-out track from this album is the re-envisioned arrangement of Phineas Newborn, Jr.’s “Sugar Ray”, which shares the rhythmic complexities similar to that of “Gingerbread Boy”. However, “Sugar Ray” also reveals another fascinating dimension of this project; the trio’s mining of the existing piece for source materials that can be re-purposed in the new arrangement. Detroit has been nurturing and producing musical giants since the beginnings of jazz. From William McKinney and Jean Goldkette in the earliest days through the ensuing decades of Kenny Burrell, Thad Jones, Teddy Harris, and Yusef Lateef, Henry Conerway becomes the latest exponent of an often-overlooked heritage that has contributed mightily to the history of jazz. Like these fellow Detroit-natives, Henry Conerway attains three distinctive traits: a profound respect for the music and the culture that produced it, an artistic discipline that pushes the boundaries of their inheritance toward new present and future possibilities and a deep appreciation for the musical community which binds them together with all those who have gone before. With Pride for Dignity – the title of which is drawn from the Kenny Banks title of the same name – exhibits original compositions of great expressivity and re-arranges classics with great care and creative impulses. This recording illustrates jazz at its best – respecting the tradition while extending it into the present and the future. Henry Conerway III has emerged as one of the most “in demand” drummers on the jazz scene in the U.S. and abroad, as evidenced by his ongoing work with such global touring artists including the iconic Freddy Cole; the stalwart Jazz at Lincoln Center trumpeter, Marcus Printup; 2015 Thelonious Monk International Jazz Vocal Competition Winner, Jazzmeia Horn; and Grammy nominated trumpeter, Russell Gunn. His notable performances include such esteemed venues as: The North Sea Jazz Festival, The Atlanta Jazz Festival; Jacksonville Jazz Festival; Savannah Jazz Festival; National Black Arts Festival; Toronto Jazz Festival; The John F. Kennedy Center for the Performing Arts; and notable NYC jazz clubs as Minton’s, Birdland, Smalls, Smoke; Jazz at Lincoln Center and its Dizzy’s Club Coca-Cola. Conerway, a proud Detroit native, made extraordinary use of the many educational and cultural opportunities of that formidable city, performing as a high school student on The Detroit Jazz Festival stages and spending several years studying under the tutelage of the late, great trumpeter, Marcus Belgrave as a member of the Detroit Symphony’s Civic Jazz Orchestra. While matriculating at Atlanta’s historic and prestigious Morehouse College (B.A. in Music Composition), Henry co-founded the group, Jaspects, which quickly became a staple in that city’s music scene and forming creative collaborations with such luminaries as Maroon 5’s P.J. Morton; Grammy nominated Janelle Monáe; Tyler Perry’s Tony Hightower, and Chantae Cann; who can each be heard on Jaspects’ recordings. Henry has also composed original works for film and performed in theatre settings including the Tony Award nominated Shuffle Along, or, the Making of the Musical Sensation of 1921 and All That Followed, on Broadway.